Macarons have been few and far between as of late. As much as I love making them, and more importantly, eating them, they can be very finicky and temperamental, especially in the heat and humidity of the summer. However, I thought, before I go back into Uni hibernation, I should probably make some, even just to know that I am still capable (and this I am now unsure of!). 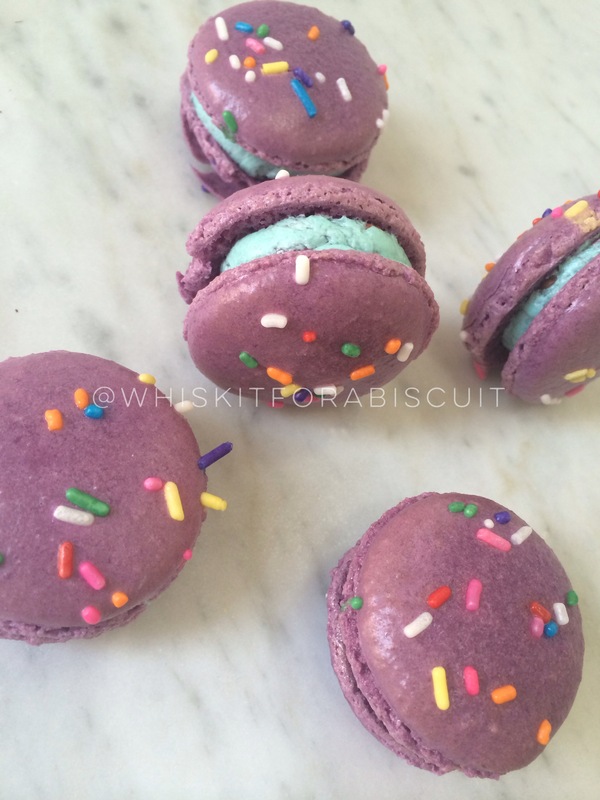 I had been on the hunt for a delicious bubblegum flavour, as I love baking with fun and nostalgic flavours. With fresh raspberries in abundance, I thought, what better than raspberry bubblegum macarons. Whilst my shells failed to comply, they were still tasty, and the intense bubblegum flavour coupled nicely with the burst of the fresh raspberry. Recipe by Adriano Zumbo. 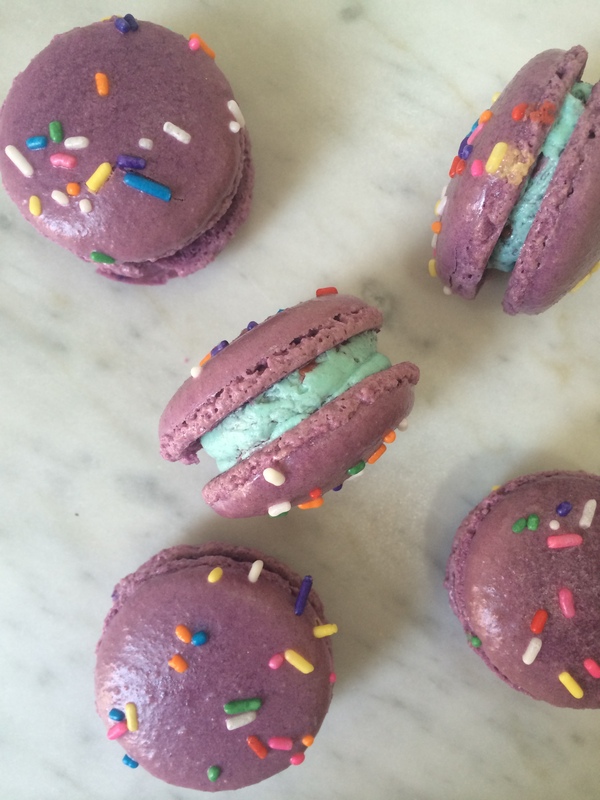 You will definitely need kitchen scales to make macarons. Spray four oven trays with cooking oil spray around the edges, and line with baking paper and set aside. Place almond meal and icing sugar in a large bowl, and sift together 3 times. Set aside, along with the 45g egg whites. Put 50g egg whites in a separate bowl. Heat caster sugar and water in a small saucepan, over a low-medium heat, until the sugar completely dissolves and begins to bubble slightly. You can also use a candy thermometer, and heat the syrup until it reaches 118 degrees C (244 degrees F). If the syrup becomes thick and powdery in appearance, you will need to start again. This is because the sugar has been heated too much, too quickly, and instead of dissolving, it has cooked and hardened. Begin beating the 50g egg whites with one hand, and with the other, stream the hot sugar syrup down the side of the bowl to create an italian meringue. Beat until stiff peaks form, the meringue should be thick and very glossy. Add the colouring gel now, taking care to only add very small amounts until your desired colour is achieved. Pour meringue into the almond meal, icing sugar and 45g egg whites mixture and mix roughly to combine. When combined, fold mixture together (one single stroke) until there are no air bubbles left. Make a spread across the top of the mixture, and it should disappear in about 20 seconds. 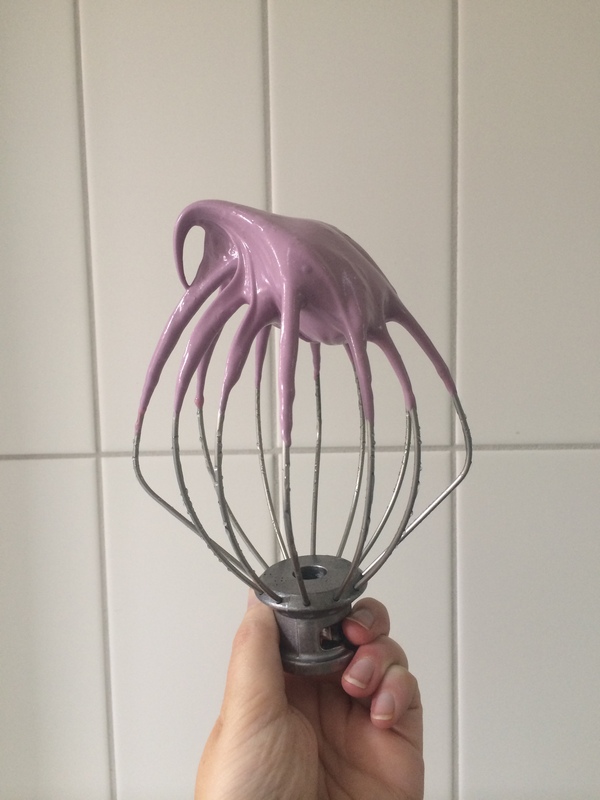 Spoon mixture into a piping bag fitted with a round nozzle. If you don’t have a piping set, most supermarkets sell plastic disposable ones with a few different nozzles. You should be able to find them in the baking aisle. Lock the bag by spinning the top around 4 times. Pipe 3-4cm rounds on the oven trays prepared earlier. 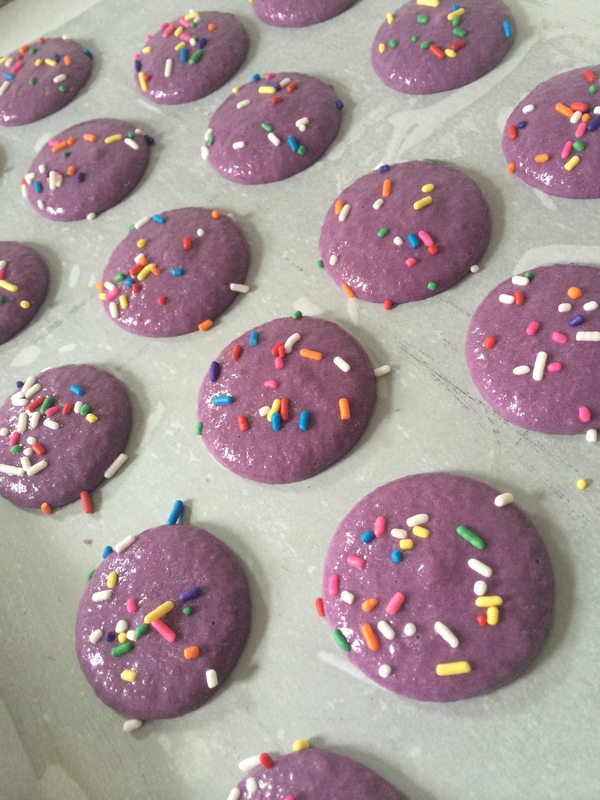 Sprinkles macaron shells with 100s & 1000s. Tap the bottom of the trays on the kitchen bench and let them sit for about half an hour, or until mixture is dry to the touch. Don’t rush this process – you want the shells to be completely dry. Otherwise, it is unlikely that the ‘foot’ of the macaron will be formed. Preheat your oven to 135c, or 125c fan forced. Place in oven and bake for 8 minutes. Turn trays around, and bake for another 9 minutes. To check if shells are cooked, gently lift one off the baking paper. If it peels of easily, they are done, if not, keep checking at 2 minute intervals. Furthermore, if you notice the tops have a slightly crumpled look after you take them out of the oven, put them back in for another couple of minutes. In my experience, this means that they are slightly undercooked and/or haven’t dried out enough before cooking. Cool on trays for 10 minutes, then peel off and place on a wire rack. The mixture should make about 12 -15 large macarons, and about 25 smaller macarons. Macarons keep really well (about 5 days in the fridge). With a beater, or in a mixer, beat butter until pale and creamy (usually 4-5 minutes). Gradually add in the icing sugar, mixing each addition until well combined. Add approx. ¼ teaspoon of colouring gel. You can always add more if you would like a deeper colour. Very carefully, add a couple of drops of bubblegum flavouring. Mine is extremely strong, so I only needed a tiny amount to achieve enough flavour. Remember, you can always put more in, but you cannot take it back out! Gently fold through the fresh raspberries through the buttercream. Pair up similar sized macaron shells. Fill a piping bag, fitted with a large round nozzle (it must be large, as you do not want the pieces of raspberry to get stuck behind the nozzle), with buttercream. Pipe rounds of buttercream onto one macaron shell, and gently sandwich with the other. Place in an airtight container, and store in the fridge. Macarons always taste better the day after you have made them, as the flavour has had time to develop. Always serve macarons at room temperature.